Our scientific theme, Integrated Biomedical & Engineering Solutions to Regulatory Uncertainty, describes how the inter-disciplinary interactions among projects address key challenges facing the Superfund. Vapor Intrusion Modeling & Health Monitoring. This research collaboration involves Projects 1 (Boekelheide; Molecular Biomarkers for Assessing Testicular Toxicity) and 3 (Suuberg; Indoor Air Concentration Dynamics and Vapor Intrusion). These projects develop improved modeling of vapor intrusion, and improved approaches to evaluating the associated health risks, focusing on the regulatory uncertainty of highly variable indoor air contaminant levels. Project 3 has a track record of basic and translational research addressing deficiencies in estimates of indoor air contamination resulting from vapor intrusion. A key contaminant of mutual concern (and great concern to US EPA) is trichloroethylene, and Project 1 is pursuing development of sensitive biomarkers to detect male reproductive health effects of exposure to this solvent. Nanotechnology Applications & Safety. This research collaboration involves Projects 2 (Kane; Adverse Human Health Impacts of Nanomaterials) and 4 (Hurt; Nanomaterial Design for Environmental Health and Safety). 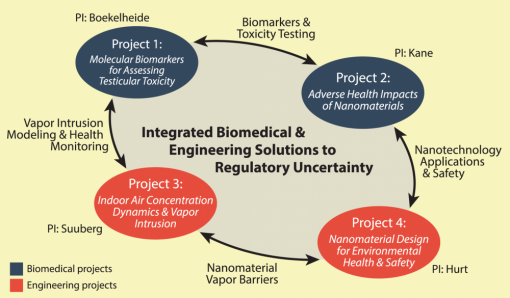 These projects explore the regulatory uncertainty regarding applications and health implications of novel nanomaterials, investigating the potential toxicity (Project 2) of new graphene-based nanomaterials that are being synthesized and optimized (Project 4) for environmental applications as vapor toxicant barriers.